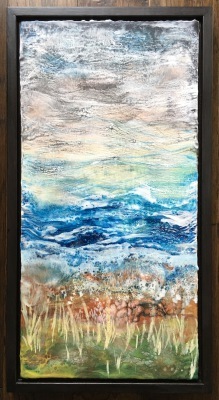 Caring for your encaustic painting. Many people express concern in regards to temperature and direct sunlight hitting the piece. 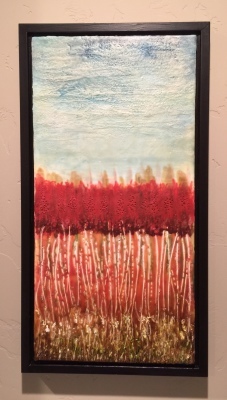 Encaustic work is resilient and can tolerate a fairly large temperature range. For example, I occasionally put a piece in the freezer to cool the surface. In fact, I left one overnight and stressed it to test durability, and discovered it was not easily marred. On the other extreme, I use my garage wall as overflow for finished work and the garage has registered as high as 110 F with no damage. If you notice your painting looking dull or dusty, simply polish with a clean dry cloth. 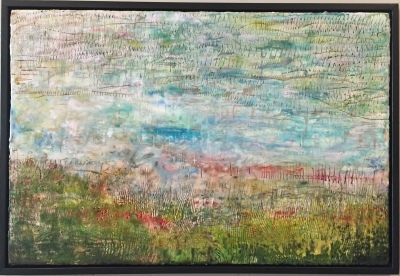 Encaustic paintings often do not show well in photographs. 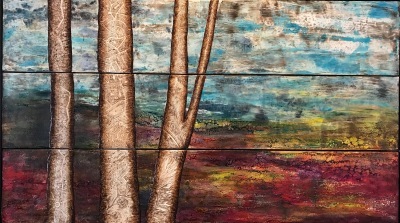 The surface texture and luminosity of the wax is difficult to translate to a 2D format. Our patrons always express how much better the works look in person. Our home/main gallery is open to appointments. Please contact us for a showing. In addition, we can send close-up pictures of any work we have on hand. Unless otherwise noted, each piece is custom framed in the studio by my husband and ready to hang. The frames not only give the piece a finished quality, but protect the edges from being damaged. I sign and label each piece on the back. 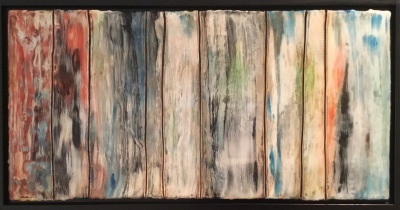 Encaustic 12 x 24 in 475. 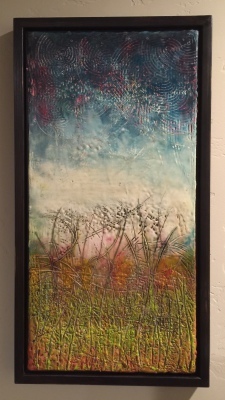 Encaustic 12 x 24 in 375. 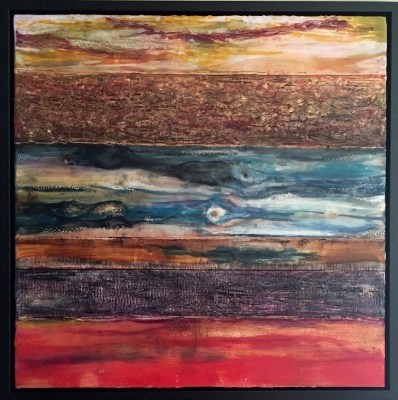 Encaustic 12 x 12 in 175. 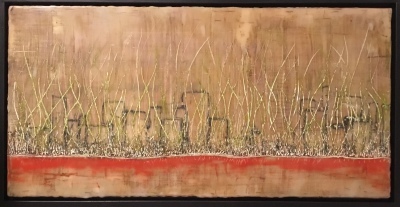 Encaustic 48 x 12 in 1000. 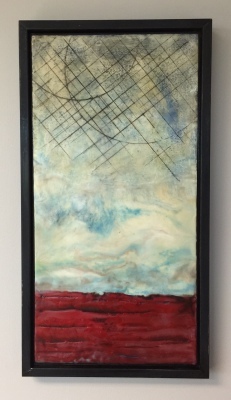 Encaustic 24 x 12 in 375. 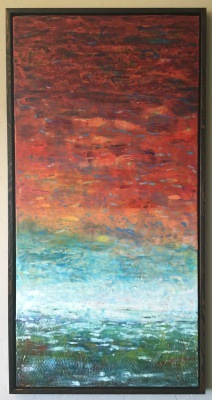 Encaustic 36 x 24 in 1800. 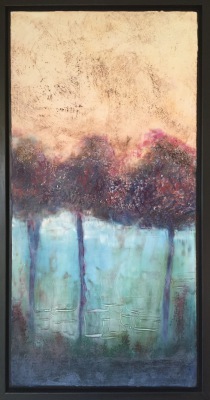 Encaustic 24 x 24 in 550. 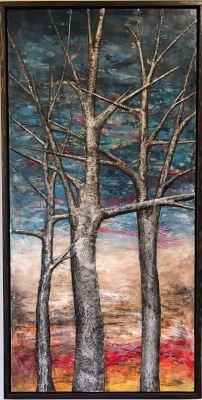 Encaustic 24 x 48 in 2400. 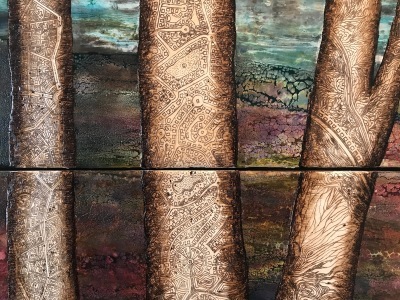 In these works I incorporate my love for painting, drawing, and doodling. Encaustic Engraving 12 x 12 inches 175.